What is a Quality Management System (QMS) ? Why do companies need a QMS? What are the regulations that apply? When should I establish a QMS? What about Software as a Medical Device (SaMD) ? Your company is developing an innovative product, and you want to get it to market as soon as possible. Most products, whether they are drugs, medical devices or diagnostics, need some form of approval (or clearance) from the FDA or your region’s regulatory body. As part of your submission, you must show compliance of both your product and your company’s internal business processes to all applicable FDA or your region’s requirements. A Quality Management System (QMS) is a formalized system that documents business and product processes, procedures, and employee responsibilities toward achieving the company quality policy and objectives. A QMS helps coordinate and direct an organization’s activities to meet market and regulatory requirements and improve its effectiveness and efficiency on a continuous basis. The core processes of the QMS should be established once your company has developed a prototype. Manufacturers must establish and follow defined quality system requirements to help ensure products consistently meet applicable regulatory requirements and product performance, safety and efficacy claims. A quality management system is necessary to achieve company goals. The quality systems for FDA-regulated products (food, drugs, biologics, and devices) are significant components of overall Current Good Manufacturing Practices (CGMP’s). Establishing a QMS early in your first product life cycle, aids in organizing documentation and ensuring appropriate processes are being followed. Ensuring that the process is implemented (written, approved, released, trained to, and being followed correctly) helps your company produce a consistent product and prevent and mitigate mistakes, thereby reducing cost and getting your product to market faster. Setting up the QMS early can help your company, especially startups, gain credibility with FDA (or your country’s equivalent), customers, and potential acquirers. Also, establishing a QMS early will help you avoid high consultant fees during the submission process. The QMS includes a system of organizing your documentation such that a consultant is not needed to piece information together. Keep in mind, launching your first product without a QMS in place is illegal, and can lead to failing your first audit. With the FDA, failing an audit results in significant extra work to avoid receiving further sanctions including and up to the seizure of your product. In the US, FDA is responsible for ensuring the safety and efficacy of products. While the core concepts of the regulation are the same for all medical products, there are specific rules for some types of products. Medical device and in vitro diagnostic devices are overseen by the Center for Devices and Radiological Health (CDRH). Current Good Manufacturing Practices (CGMPs) requirements for devices 21 CFR Part 820 is the primary minimum standard applicable to medical device companies that market and sell products in the US. CDRH defines a “medical device” as “any healthcare product that does not achieve its principal intended purposes by chemical action or by being metabolized.” Devices are therefore everything from tongue depressors, to pacemakers, to MRIs and digital (app) therapeutics. To market a product outside the United States (‘OUS’), there are several agencies to which you will need to submit depending on your desired marketing geography. ‍CE marking is a certification mark which indicates that your device conforms to the health, safety and protection standards outlined by the European Economic Area (EEA) and is granted by one of numerous possible authorized Notified Body agencies. Your company contracts with one of these Notified Bodies to complete ISO certification audits such ISO13485 Quality Management Systems for Medical Devices and ISO 14971 Risk Management for Medical Devices as well as to review and approve your device submission all prior to marketing your device in an EU state. Health Canada is the regulatory body that ensures the safety of drugs and devices available in Canada. The China Food and Drug Administration (CFDA) is responsible for supervising the safety of food, cosmetics, drugs, and devices in mainland China. Many other countries have specific agencies for themselves as well. All regulatory organizations have guidance documents available on their websites. Read our FDA and Notified Body 101 Guide to learn more. If your company markets a product OUS, you will also have to follow the local regulations as well as applicable ISO standards. Compliance with applicable ISO standards is often seen as the first step in achieving compliance with European regulatory requirements. One of the regulations, ISO 13485 is a globally accepted standard (recognized by FDA) and provides a way to comply with general quality management system requirements. FDA also recognizes many such standards which then can aid you in designing and developing your product for the US market as well. Demonstrating compliance to an applicable international standard aids FDA in evaluating whether your product was designed and developed according to current best practices. The FDA and the international governmental agencies want companies to demonstrate the safety and efficacy of their product. FDA inspects manufacturers or processors of FDA-regulated products to verify that they comply with relevant regulations. 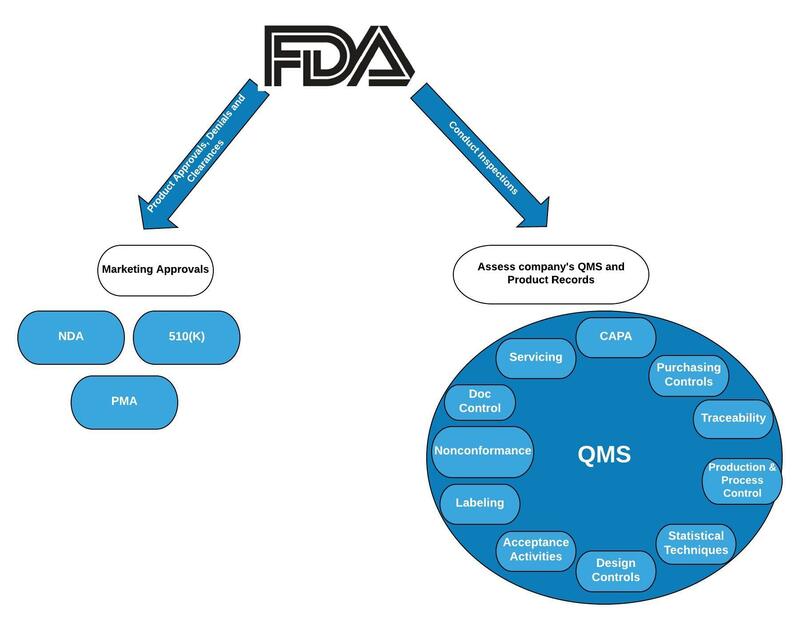 FDA has explicit requirements for various types of regulatory submissions prior to commercializing a product as well as the various business processes that comprise your QMS. Device classification depends on the intended use of the device and also upon its indications for use. Devices are classified based on their level of risk and categorized as Class I, Class IIa, Class IIb or Class III, each with increasing risk, requirements and scrutiny. The device classification determines the type of submission required to market and sell it. Read our Product Risk Classification Guide to learn more about how products are classified. Regardless of the device classification, all medical devices/diagnostics are required to have a QMS (21 CFR Part 820) at the time of submission. The QMS of a startup is comprised of over a dozen sub-parts which can be implemented the first time at various stages of initial product development. For your company’s second and all future products, the QMS will already fully be in place. Ideally it’s best to start establishing a QMS once you are in the design and development phase, minimally once you achieve design “freeze” (or frost). During each phase, primary subparts are what you will be using the most, and the secondary subparts should be established for use as needed. Let’s take a closer look at some selected subparts. View the full regulation. Document Control focuses on document distribution, changes, and approvals. Through Document Control, companies establish procedures and processes to store documents and records and record changes/revisions and approvals; this system can be either paper-based or electronic. It stores the “single source of truth” of regulated documentation - and the history of that documentation; this is accessed and used by nearly all employees. Before submission, companies must demonstrate that their Document Control process is in place. The goal of the Training is to ensure that all employees in the company are trained on their responsibilities and the applicable QMS elements and procedural requirements prior to conducting activities within the QMS (being trained to do work before they do the work). In addition, manufacturers must provide procedures for identifying training needs and making sure that employees are trained accordingly. The goal of Design Control is to ensure that the product development process produces products that meet user needs, company-defined specifications, and fulfills the designed intended uses. Design control begins with early prototype development and documenting user needs and requirements, and continues through final design information and throughout all design testing. Design control does not end with the transfer of a design to production. Design control applies to all changes to the device, including those occurring long after a device has been introduced to the market. 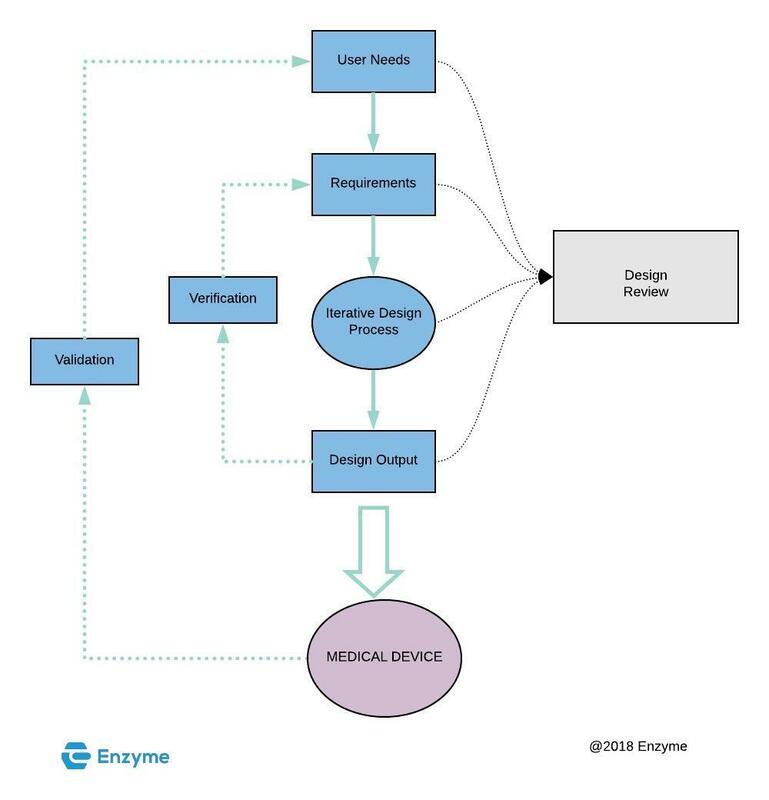 Design control is the single most misunderstood aspect of medical device regulation. Startups can streamline the design control process by matching it to the needs of their company. Regulations are written loosely enough such that a variety of agile and waterfall workflows are acceptable to follow; there are basic documentation requirements that are easy to follow. Validate that your final product meets the user needs under the intended use conditions. As part of the FDA submission, you have to demonstrate that your Design Control process is in place. Risk Management is an important part of an effective QMS. It enables the identification of sources of risk and assesses those risks to prioritize efforts to control and mitigate them. "While the requirement for the conduct of risk analysis appears in Section 820.30(g) Design Validation, a firm should not wait until they are performing design validation to begin risk analysis. Risk analysis should be addressed in the design plan and risk should be considered throughout the design process. Risk analysis must be completed in design validation." Therefore, Risk Management begins when you start establishing your user needs and requirements. As your design evolves, you can identify new risks and the controls to mitigate them. As a result, unacceptable risks can be identified and mitigated early in the design process and help reduce rework and cost. 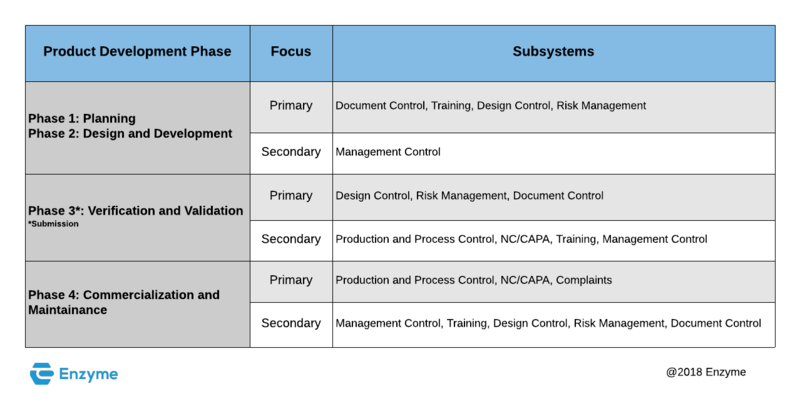 Risk Management is an ongoing process that is tied into various other subparts of the QMS, most importantly the product design, development and manufacturing processes. Management Responsibility is an important element of the QMS for senior leadership. Company management is ultimately responsible for establishing policies, objectives and an organizational structure. They must ensure adequate, trained, resources are made available to implement and maintain the QMS. Read the FDA’s guidelines for more details. When you submit to the FDA, they evaluate if management has all the documentation and processes in place to implement the QMS. Production and Process Control ensures that the products your company manufactures consistently meet specifications, and are validated as outlined in your documentation. Production and Process Controls must be in place before you submit to the FDA. The purpose of a CAPA process is to detail how your company deals with product and process quality issues, preventing their recurrence/occurrence. CAPA must be established before your company submits to your regulatory organization. Also, CAPA is an auditor’s main insight into your company’s internal processes. Every single audit (except maybe your first) will involve a review of your CAPAs. In 2014, most of the warning letters (which are made public) that FDA issued were due to poorly implemented or executed CAPAs/CAPA systems. The use of software medical devices is increasing and extends beyond traditional hardware and software. "SaMD is defined as software intended to be used for one or more medical purposes that perform these purposes without being part of a hardware medical device." 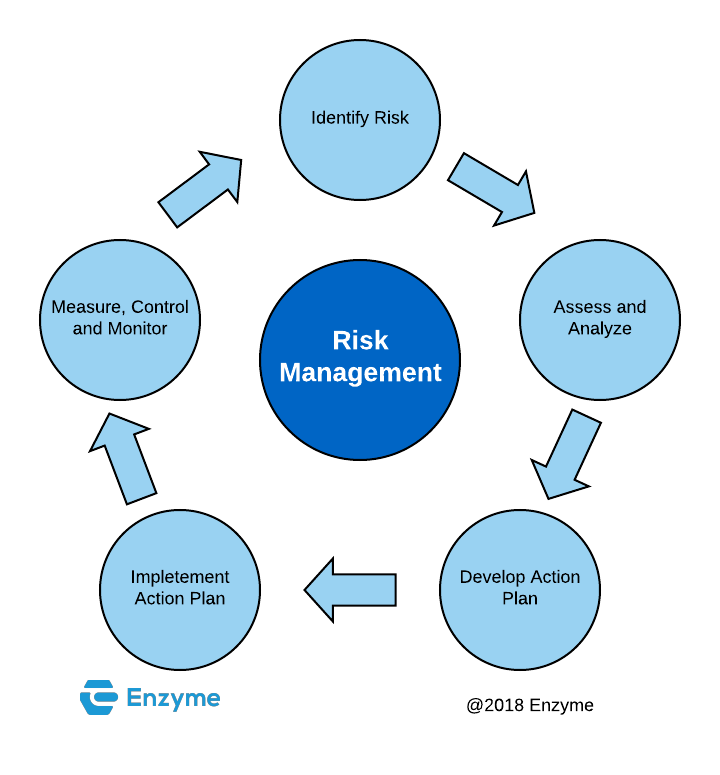 In order to develop SaMD that are safe, you have to identify risks, establish measures/features to control and mitigate those risks, and demonstrate confidence that the residual risks are acceptable. Simply testing the software is not enough; risk management principles should be built into the software to assure its safety. You must also establish a design and development process, post market surveillance and change control; in other words, SaMD products are treated the same as traditional medical devices throughout the product life cycle. FDA is evaluating alternative approaches to regulating SaMD products, including basic quality system regulations as well as submission requirements under a new program called Digital Health Software Precertification (Pre-Cert) Program. Contact info@enzyme.com for more information. View a comprehensive list of medical device-specific subparts. View to learn how the Code of Federal Regulations is organized in general for all products regulated by FDA (including food, drugs, cosmetics and medical devices).